Bokhara. I. A khanate of Independent Turkistan, central Asia, between lat. 36° and 49 X., and lon. (12° 30'and 69°30'E. ; bounded N. by the desert of Kizil Koom, N. E. and E. by Russian Turkistan, Khokan, and Koondooz, S. by Balkh, Maimana, and Afghanistan, and W. br Khiva; area, about 100,000 sq.m. ; pop. roughly estimated at 2,500,000. The western parts, with the exception of the banks of the Jihoon, which are lined with luxuriant vegetation, present the appearance of a vast desert similar to those of Arabia, devoid of all animals, and subject to the tebbad, a hot dry wind, which sweeps swiftly across the arid plains, and if overtaking a caravan overwhelms both men ami animals, and not unfrequently proves fatal. The eastern part of the khanate, which is hilly and watered by affluents of the Jihoon and the Zerafshan or Kohik, is more fertile. Spurs of the Paropamisan range in the southeast give rise to a number of streams. The three principal rivers, along which lies nearly all the cultivated land, are the Jihoon or Amoo Darya (the ancient Oxus), which flows N. W. through the centre of the country; the Zerafshan, flowing W. from the now Russian territory of Samarcand to and past the city of Bokhara, and dividing into several channels, which with artificial irrigating canals form a network of streams rendering the district exceedingly fertile; and the Shehri-zebz, between the Zerafshan and the Jihoon. The last two terminate in small salt lakes or are lost in the sand. The cultivated land is divided into squares with boundaries marked by ridges of turf raised slightly above the level of the plain. The water from the rivers and canals flows through trenches, which, as well as the narrow roads of the farm lands, are lined with trees. The climate is temperate, the summer beginning in March and lasting till October. During this season no rain falls, and the thermometer rises to 90° in the day, but the nights are cool. October and February are the rainy seasons. The winters are open, though sometimes the snow covers the ground for a fortnight, and in January, the coldest month, the mercury falls as low as 6°. The more violent storms come usually from the northwest. They are often accompanied with clouds of sand and dust which render ophthalmia frequent, but otherwise the climatic influences are healthy. The principal vegetable productions are wheat, barley, millet, rice, sesame, hemp, tobacco, pulse/ tropical fruits and vegetables, a species of indigo plant, manna, cotton, and silk. Bang, an intoxicating drug, is made from hemp seeds. Gold is found in the rivers, salt is obtained from the small lakes, and sulphur and sal ammoniac are also found. Timber is brought from the mountains, but on the plains only willow and poplar are found. The wild animals of Bokhara are bears, wolves, foxes, jackals, wild asses, hares, and antelopes. The domestic animals are horses, camels, dromedaries, asses, oxen, sheep, and goats. The sheep are of the fat-tailed breed, and there is a peculiar species with a jet-black curly fleece; lamb skins are exported to Persia. The goats of Bokhara are a variety of the Thibetan and Cashmere breed, and yield a fine shawl hair. The population of Bokhara is composed of different nations, Uzbecks, Tajiks, Turkomans, Afghans, Kirghiz, Arabs (the descendants of the Mohammedan conquerors), Kalmucks, Hindoos, and Jews. The Tajiks are supposed to be the most ancient inhabitants, and are said to resemble the Caucasian type most nearly; they have a large portion of the trade and manufactures in their hands. The Uzbecks lead mostly a nomadic life, and are noted for their hospitality to strangers. The Persians are nearly all either slaves who have been kidnapped by the Turkomans and sold here, or such as have purchased their freedom; they enliven trade, enter the government service, and several of them occupy the highest positions in the state. The Jews here as in the adjoining countries are the persecuted race, emigration even being forbidden them. The Turkomans roam over the country with their flocks and herds, plundering and kidnapping persons on the frontiers and selling them into slavery in the interior. Turkic dialects are spoken by most of the inhabitants. The prevailing religion is the Mohammedan. A considerable trade is carried on with foreign countries by means of caravans, though the extortionate customs dues in Bokhara, as in the neighboring states traversed by the caravans, and the predatory habits of the Turkomans tend to cripple it. The imports from Russia are muslins, leather, metals, dyes, and paper; from Afghanistan and India, English manufactures, Cashmere shawls, and sugar; from China, tea and porcelain. The exports are rhubarb, cotton, skins, raw and manufactured silk, camel's and goat's hair, fresh and preserved fruits, and shawl goods. - The government is a military despotism. At its head stands the emir as commander-in-chief, prince, and chief of religion. Under him are the vizier, the mehter desturkhanje (steward), and zekialtchi (receiver of customs). The military and other civil dignitaries are divided into three classes, the kette sipahi (higher functionaries, comprising the secretary of state), the orta sipahi (the middle functionaries), and the ashaghi sipahi (subalterns). The administrative divisions of the country are based upon the larger cities, and include at present Karakul, Bokhara, Karshi, Tchardyui, and Shehrizebz. The last named, owing to its continual struggles with the khan, is not at all times wholly subject to him. Each division has a governor, who is allowed as his salary a fixed share of the revenue of the district. - The country was little known to the ancients, and the greater part of it was included under the general name of Transoxiana or Sogdiana. The conquests of the Mohammedans extended to the foot of the Bolor Tagh, and to them Bokhara, in its former and wider extent, was known as the Mawar-al-Nahr, and became famous for its great seminaries of learning at Samarcand, Balkh, and Bokhara. Even in modern times these cities, of which only the last now belongs to the khanate, enjoy a considerable reputation for their schools. For several centuries before the conquest by Genghis Khan, about 1220, Bokhara was regarded as belonging to Persia; but subsequently, and chiefly after the invasion by the Mongols under Tamerlane in 1370, the Persian element gave way to that of the Uzbecks. and Tamerlane intended to make Samarcand his capital. At the close of the 15th century his descendants were driven from power by the house of the Sheibani. The ablest of these was Abdullah Khan, born in 1533, who conquered Badakhshan, Herat, and Meshed. His son was unable to maintain his throne, and was assassinated in 1597. The overthrown dynasty was succeeded by that of the Astra-khanides (descendants of Genghis Khan), who remained in power till 1737. Ebul Feiz, the last of this dynasty, was murdered by Rehim Khan, who ruled with independent authority, but under the title of vizier. Upon his death the government was seized by Daniel Beg, to whom succeeded the emirs Shah Murad, Said Khan, and Nasrullah Khan. The last of these is known by the wars which he waged with Khokan, and by his barbarous treatment of several European travellers. In 1838 the British ambassador to Persia sent Col. Stoddart to Bokhara, to assure the emir of the friendly feeling entertained toward him by England. Nasrullah, enraged at receiving no reply to letters which he had sent to the queen, threw Stoddart into prison. Capt. Conolly, who was sent on a like errand, met the same fate, and both were put to death in 1842 on charge of being spies. Since then few Europeans have visited Bokhara. The missionary Wolf went there in 1843, and brought back tidings of the fate of Stoddart and Conolly. In 1841 a Russian expedition, consisting of Col. Bateneflf, Lieut. Bogoslovsky, the geographer Khani-koff, and the naturalist Lehmann, visited Bokhara at the request of the emir; the last two published accounts of their journey (Khani-kofT, "Description of the Khanate of Bokhara," in Russian, St. Petersburg, 1843; translated into English by Bode, London, 1845; Lehmann, Reise nach Bokhara vnd Samarkand, St. Petersburg, 1855). In 1863 three Italians, Gavazzi, Litta, and Meazza, went there in order to procure eggs of the silkworm. They were imprisoned, but were released after a year through the intervention of the Russian government. 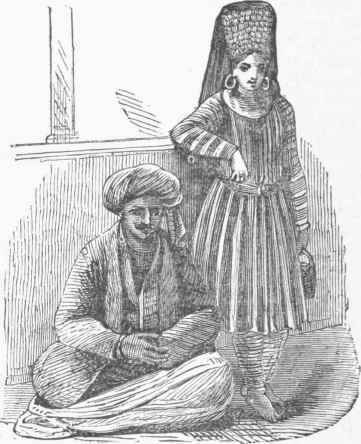 In the same year Vambery, a Hungarian scholar, disguised as a wandering dervish, traversed a great part of Turkistan. His two works, "Travels in Central Asia" (London and New York, 1865), and "Sketches from Central Asia" (1807), furnish the most valuable information respecting Bokhara, and its relations to the other khanates. (See Kno-kan.) In 1850 the Russians established themselves at the mouth of the Sir Darya, on the of Aral, and began to push southeastward along the course of that river. They overran Khokan, and in 1865 annexed the northern part, while the remainder was formed into an independent khanate under the protection of Russia. Mozaffar Eddin, who had succeeded Nasrullah, attacked this khanate in 1866, and was defeated by the Russians, who took possession of the whole region of the Sir Darya. A treaty was entered into in November, 1867; but hostilities broke out again in the following spring. The Russians took Samarcand, and moved toward the city of Bokhara. The eldest son of the emir raised an insurrection against his father, and Mozaffar Eddin threw himself upon the protection of the Russians, ceded to them Samarcand and the adjacent territory, promised to pay an annual tribute, and virtually became a dependant of Russia. In 1868 the emir became engaged in hostilities with Cabool, and by Russian aid gained the region as far south as the Jihoon, which in 1869 was established as the boundary between Bokhara and Afghanistan. In 1870 the fanatical princes of Shehrizebz made an incursion into the Russian territory, but were defeated. Instead of taking possession of Shehrizebz, the Russians made it over to the emir of Bokhara. The emir has a standing army of 40,000 cavalry, which in case of need can he increased to 60,000. II. A city, pita! of the khanate, on a branch of the Zerafshan, in lat. 39° 45' N., lon. 64° 25' E., 430 m. N. W. of Cabool; pop. about 70,000. It is surrounded by a wall pierced by 11 gates, and is divided into two parts, the inner and the outer city, which again are subdivided into quarters. It contains upward of 100 mosques, and about 80 medreses or colleges. The instruction given in these institutions is upon the Koran and religious casuistry, and there are a few books on logic and philosophy. Poetry and history are regarded as frivolous subjects of study, and even disgraceful. The number of students is represented at 5,000 from different parts of the khanate and the bordering states, India, China, and Russia. The poorer students have a yearly pension from the emir. The streets are narrow and tortuous, and the houses built chiefly of brick or mud with flat roofs; glass is unknown except in the form of beads or other ornaments, and the windows are furnished only with wooden shutters. The bazaars are mostly of wood, with mats stretched across; very few are of stone. The emir resides in the citadel, which is defended by a few old brass pieces. The supply of water is scanty. A disease called the Rishte is peculiar to Bokhara, and is attributed to the bad quality of the water. It consists of a boil from which issues a long worm like a thread. This is carefully extracted, and sometimes the whole infected place is cut out. In either case it leaves a hideous scar, completely disfiguring the person if attacked in the face. The favorite and universal beverage is tea, of which there are several excellent kinds superior in flavor and quality to those in western markets. European cotton and woollen stuffs, cutlery, beads, etc, find their way into Bokhara through the medium of Persian traders and dervishes. Coarse woollen and cotton goods, as also the finest silks, and leather boots, are manufactured. - Bokhara is supposed to be the Trybactra of the ancients. In the middle ages it was successively the capital of Turkistan, of the Samanides, and of various Mongol rulers. In 1219 it was captured and burned by Genghis Khan, but was rebuilt soon after. In 1370 it was captured by Tamerlane, whose dynasty reigned there till 1498. Since that time the history of the city is merged in that of the khanate. - See "Bokhara, its History and Conquest," by Prof. Arminius Vambery (London, 1873). Lady and Gentleman of Bokhara.